Ottimo appartamento a St. Giorgio. Situato nel villaggio sportivo con accesso alla Clubhouse, che comprende piscina, vasca idromassaggio, palestra, tennis, pallavolo, racquetball, golf al coperto e sala giochi. L'accesso alla club house e quei servizi sono gratuiti per un massimo di 8 ospiti; eventuali ospiti aggiuntivi pagano $ 3. 00 al giorno a persona per avere accesso. Tre camere da letto, due bagni, con cucina completa. BBQ sul patio e godetevi le viste mozzafiato. Wifi e TV via cavo forniti. La camera da letto principale ha un letto matrimoniale, vasca / doccia, ampia cabina armadio e un nuovo 32 "TV a schermo piatto con lettore DVD. La seconda camera ha un letto completo. La terza camera ha un letto a castello a due letti e un letto a castello con due letti singoli. La camera familiare ha una grande sezione. La camera familiare ha un televisore da 50 "con DVD. Adiacente alla camera familiare è una grande sala da pranzo che può ospitare comodamente fino a 10 persone. C'è una lavatrice e asciugatrice per la vostra convenienza. Goditi una bellissima alba al mattino o un barbecue la sera nel tuo patio privato. Per quelli di voi che sono appassionati di outdoor, ci sono sentieri per escursioni a piedi, in bicicletta e in corsa a pochi passi. 11 campi da golf entro 10 minuti dal condominio! (diversi entro cinque minuti! ), Mesquite è proprio dietro l'angolo a soli 35 minuti con più campi da golf e grandi casinò con fantastici buffet, e per voi amanti della natura, Zions Park e Bryce Canyon National Parks, Grand Staircase, Great Basin National Park, Lake Powell e il Grand Canyon sono tutti in viaggio di mezza giornata / divertimento! Really enjoyed our stay at this condo. Loved having the clubhouse and pool so close. King bed in the master was super comfortable and loved the patio and the view! This property is in great location, has a prefect layout and the owner is very helpful. 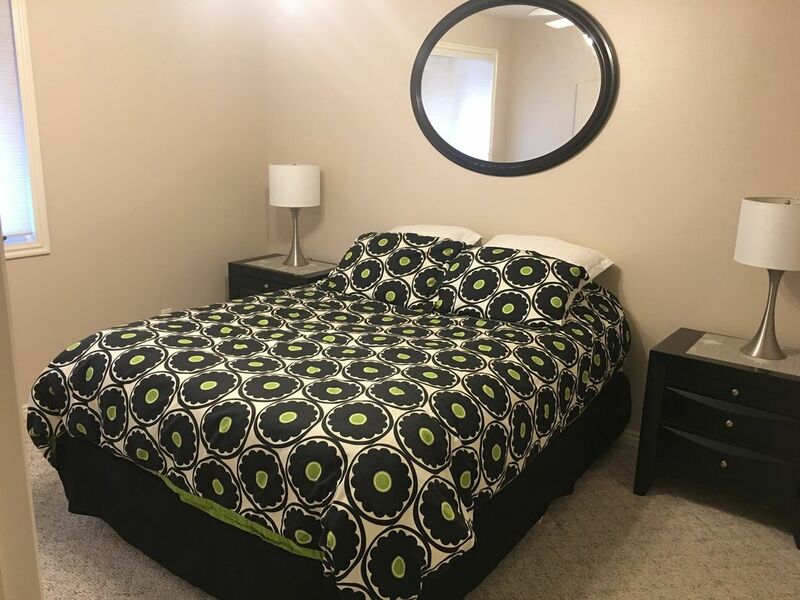 Rent this unit when in St. George, Utah. Thank you so much. We loved having you as a guest. After a long car ride and busy day in the city, coming into this unit was such a pleasant experience! The communication with the owner was prompt and very helpful. Everything was clean and organized. Even though we didn't stay long enough to fully enjoy the amenities (laundry, kitchen, board games, televisions, etc.) our time was restful and quiet. The beds comfortable. Fully stocked linen closet. The views from both back patios are breathtaking! We would love to stay in this unit again and stay much longer. There are no complaints from this family! Thanks so much for staying at our condo. We would love to have you stay with us again anytime. This was a nice place to stay. There was plenty of room for the nine of us. The kitchen was well equipped. We enjoyed swimming and playing at the club house, which is close to the unit. Thanks! The house was great. Everything was clean and the kitchen was packed with everything we needed like forks, straws, etc..... Great Wi-Fi, beds and a beautiful backyard view. Colby was great and fast responding our questions and even let us check in a little earlier. The only reason I did not give a 5 star grade is because we were not informed that the pool and game room would be closed the days we were staying in the house and we were really looking forward to using it. Other than that everything was perfect! We enjoyed our stay in this condo. It is located in an "older" area of St. George, but still very central (at least for everything we ended up doing) and beautiful. We had eight people (my wife and me, our kids, and Grandpa and Grandma) staying in the apartment over a weekend. There were beds for everyone and we all slept comfortably. The view out back is gorgeous, and there was plenty of room for all of us to hang out in the condo. The pool, hot tub, shuffle board court, basketball courts, tennis courts, and other amenities were top notch! I’ve rated the condo 4 out of 5 stars due to the unit not being as clean as we thought it should be. We resolved some of the issues by wiping things down ourselves, but were a bit surprised that things had been missed or overlooked by the cleaning crew. I communicated these things to management and they were very responsive, apologetic and accommodating. I was very impressed with how they handled the situation.